This week at Just Add Ink they have a colour challenge. These colours just make me feel happy..so bright and fresh. I started with a base of Tempting Turquoise and swiped with my white craft ink pad. 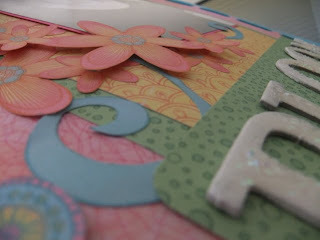 I then added paper from the Kaleidoscope DSP from the Summer Mini Catalogue. My embellishments have been cut from the papers from this range. 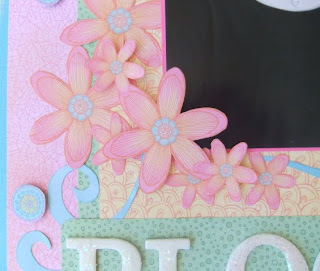 This is one of my favourite ways to use patterned papers. 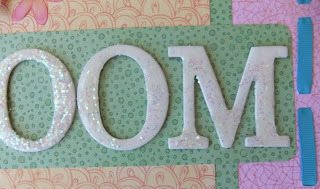 I covered my chipboard letters with White Craft Ink and then applied a layer of crystal effects and chunky glitter. I left these to dry overnight before adding to my layout. Some of the flowers have been popped up on dimensionals. I also used the double slot punch to thread Tempting Turquoise ribbon along one edge of my layout. 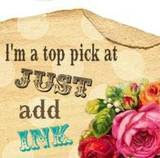 Be sure to check out all the entries at Just Add Ink. Totally in love with the chipboard letters. 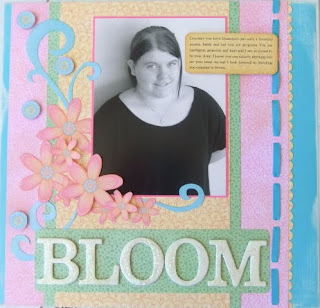 A great scrapbook layout. Lisa I LOVE IT! I am going to have to case this layout! I have all the ingredients except the chipboard and once my bigshot arrives with my alphabet - away I will go!!!! Your cutting is bewdiful! This is just really really lovely Lisa - it is so fresh and pretty - Love the layout as well! Yep, those chipboard letters look fantastic! Gorgeous layout too. Thanks for playing!